Ready to wear Nomination Bracelet with 5 9ct rose gold charms. 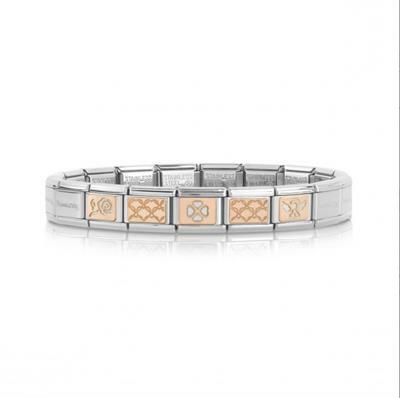 Stand out in this twotone bracelet created from stainless steel and 9ct rose gold with hearts, angels, clovers and flowers. Show someone you love them with this special ready to wear Nomination bracelet that will be stunning on its own or stacked in with an existing Nomination charm collection.